The ARX-160 Assault Rifle is fairly similar to a Submachine Gun in characteristic. Therefore it is best used at medium range, but, since it is still an assault rifle, it is also effective at long range. Avoid short range engagements and use cover to get an advantage over enemies. 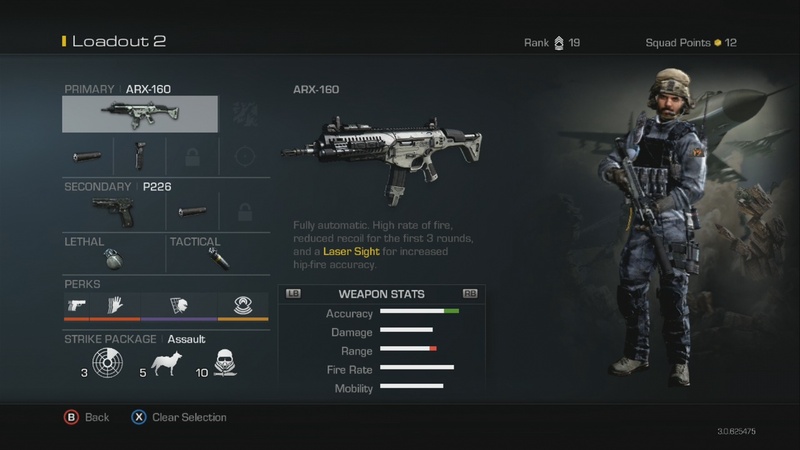 The ARX-160 is similar to a Submachine Gun, except that it has lower mobility. This means that you can’t strafe effectively so you have to use cover or flank enemies to ensure you win a gunfight. The ARX-160 is best at taking on enemies. The high fire rate and solid damage means that you can take out opponents quickly and effectively hold down a position. But be sure to move frequently so enemies don’t know where you will shoot them from next. The attachments that I found most useful were those that supported the ARX-160 in areas it is already good at and support it in areas were it is bad. It comes with an inbuilt laser sight which increases the hip fire accuracy. Since you will spend a lot of time near opponents stealth is important. The suppressor will keep you off the radar, and the Off the Grid perk will make you invisible to enemies SAT COM and radar pings. To increase the accuracy of the ARX-160 use the Foregrip attachment. Because the ARX-160 has worse handling characteristics than Submachine Guns use Ready Up so that your gun comes up faster after sprinting. To ensure you aren’t caught reloading use Sleight of Hand. In summary the ARX-160 is good at medium range and solid at long range. The suppressor, Foregrip and selected perks will make gunfights at those two ranges easier to win and let you stay in stealth. This entry was posted in Assault Rifles, CoD Ghosts Weapon Guide and tagged ARX-160, ARX-160 best Class Setup, ARX-160 Best Soldier Setup, auluftwaffles, AXR-160 Guide, AXR-160 Weapon Guide, best Class Setup, Best Soldier Setup, Call of Duty, Call of Duty Ghosts, Class Setup, Games, gaming, Ghosts, guide, PC, Ps3, PS4, Soldier Setup, video game guides, Video Games, XBOX 360, XBOX ONE. Bookmark the permalink.